For my fiftieth birthday (yeah, I'm now that old! ), Sandra decided to give me one of the best birthday presents I ever received: a ten day cruise to the Caribbean, stopping at five ports of callr: St. Thomas (USVI), Antigua, Barbados, St. Martin, and Tortola (BVI). From New England, we took a ferry from New London to Orient Point, and then arrived at Sandra's father's condo. The next morning, Sandra's father and brother drove us into New York City to Pier 88, where the lovely Norwegian Gem was waiting to take us to paradise. 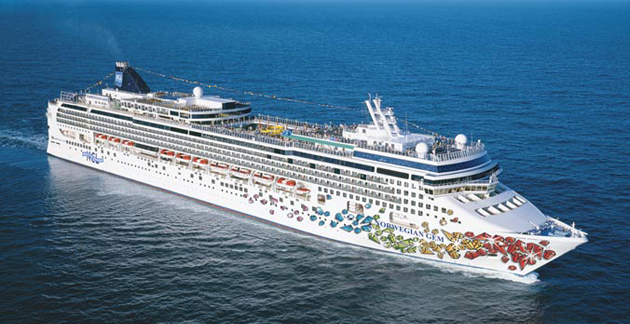 The ship is huge, and has room for 2,900 passengers. Of those, there were only about 200 children, so I guess that Sandra and I were about the median age of the passengers on board. (The cruise director, Ray Carr, mentioned that the very next cruise, departing from NYC to the Bahamas, would have nearly a thousand kids on break... shudder!). Norwegian Cruise Lines has what they call "Freestyle Dining" which means that there are no set times for dinner. That means that you can have dinner at 5pm one day, 7pm the next, etc. There are also specialty dining rooms that feature different cuisines. Since this is more or less a food blog, this post will discuss the various dining options that we encountered. The Orchid Garden has Chinese, Thai, and Japanese menu items. A cover charge applies, but we found that it was frequently discounted to half price between 5:30 and 7:30 nearly every day of our cruise. While this may not be the best Asian restaurant that I ever ate at, it had some wonderful soups (I've always loved soup). Part of the Orchid Grill complex includes a Sushi Bar and a Teppanyaki (Japanese hibachi-style restaurant), but NCL lists those as separate restaurants, so I'll also do that. This restaurant has traditional Japanese Hibachi grill of the kind made popular by Benihana. There are only four grills with seating for eight, and we found that this was nearly always fully reserved at dinner. There is also a single seating for lunch, and we saw that it wasn't that filled then. There's a cover charge for eating here. Sandra and I didn't eat here. Sandra and I ate here for lunch on day early in our cruise. We ordered about five different items, including spicy tuna roll and a shrimp tempura roll, and we found we were so stuffed, we couldn't finish. Interestingly, the Sushi chef told us he was not allowed to package the leftovers for us to have in our rooms (how unfortunate; the food was so good!). We intended to go there a second time, but we never found the time to do so. There's a cover charge for eating here. This is one of the "main" dining rooms, and has a menu that changes every day. Apparently, it shares the same dinner menu as Magenta, but unlike Magenta, it offers breakfast, lunch, and dinner. This was the first place we had breakfast on our cruise, and the two of us were sorely disappointed. The place was very crowded, and we were seated at a table of four with a couple of other guests. Service was slow, and the waitress didn't always get the correct items (Sandra and I ordered hot tea, and the only tea bags they gave us initially were "Apple Cinnamon." I didn't order a fruit tea!). For lunch, the service was better, and the food was actually quite good. We didn't eat dinner here. As mentioned above, the dinner menu at Magenta is the same as in the Grand Pacific, but Magenta doesn't serve breakfast or lunch. We ate dinner here once, and the food was nice, and the service was great. Sandra and I ate here once. There is steak of all kinds here, from prime rib to filet mignon. The prime rib was cut large and served the way I liked it. Sandra seemed to enjoy her meal as well. There's a cover charge for eating here. Sandra doesn't really enjoy French restaurants, but we overheard from other passengers that the steak at Le Bistro was actually better than the ones at Cagney's. We finally tried it, and we enjoyed it. It has an intimate feel about the place, and my Steak au Poivre was simply fantastic (cooked perfectly and very tender, the sauce was great). There's a cover charge for eating here, but occasionally you can find it discounted to half price during your cruise. This was both Sandra's and my favorite dining option. Latin cuisine with an emphasis on Mexican. Excellent soups (Sandra loved the tortilla chicken soup; I couldn't get enough of their black bean soup), appetizers, and, best of all, one of the best dishes on the cruise: Il Popo. This is sort of like fajitas taken to another level. This was a dish for two, and consists of your standard fajita fare: chicken, steak, veggies, with accompaniments of rice, guacamole, salsa, and four flour tortillas. The meat and veggies are on a cast iron stand with little spikes radiating out from it on which the various meats and vegetables are placed. There is also an excellent drink menu featuring (of course!) tequila and margaritas. The hostess recognized us the second time we ate there, and the third time we ate there, we had the same waitress from the first time, and she remembered EXACTLY what I had to drink then! Needless to say, the excellent food was matched by their excellent service. You can see why this became our favorite destination. There's a cover charge for eating here, but it is almost always discounted to half price between 5:30 and 7:30. For some reason, Sandra and I found this the most difficult restaurant to get into. Nearly every morning when we'd make our reservation, it was fully booked until 8:30 or 9pm, which was after the "half price" time of 5:30 to 7:30pm. We always had to make our reservations the day before, which we will take into consideration the next time we are fortunate to cruise on the Gem. The food was enjoyable once we were able to get there, and the service was courteous and friendly. There's a cover charge for eating here, but it is frequently discounted to half price. At first, the name of the restaurant turned me off; I thought it was vegetarian cuisine. Boy was I mistaken. It became the restaurant of choice for breakfast and lunch. This is a large buffet and it was surprising to me in the depth of its cuisine. For breakfast, there were multiple chefs ready to prepare you an omelet to your exact specifications. There was also French toast, pancakes, oatmeal, cereal, and just about any item you would normally associate with your morning meal. For lunch, there were many options from crepes, Indian/Pakastani (chicken curry, basmati rice, even papadums! ), hamburgers, hot dogs, a carving station, and ice cream. We only walked past the buffet at dinner time, and there was different items for dinner, including a chocolate fountain. (Near the end of the cruise, Sandra went to a special "chocolate buffet" and the pictures she returned with showed many lovely chocolate creations, including a model of the Norwegian Gem itself!) Seating was difficult to get; it was nearly always crowded. However, we quickly found that the cafe extends outside to the Great Outdoors at the aft of the ship, where you could eat either at a conveniently located bar or at one of the many tables outside. When I first saw this grill, I thought it was the main buffet. It serves mainly hamburgers, hot dogs, chicken pieces. On a few days, they had enormous barbecue grills cooking ribs, kielbasa, chicken, and some pasta or rice dish. This is popular, mostly because people didn't have to leave the pool area to get some food. At breakfast, they serve cereals and fruits, although there are areas that say "Eggs," they never seemed to be opened in my experience. The Garden Cafe, which is a quick walk toward the aft, has a much more extensive menu if you find the Topsider fare too limited. The Blue Lagoon is advertised as the place to go when you are hungry twenty-four hours a day. However, for a sit-down restaurant, it has the most limited menu. For lunch and dinner, the selections are hamburgers, fish and chips, meatloaf, etc. My burger was all right, but Sandra was extremely disappointed in her fish and chips. We only went here once. And there you have it... lots of choices, and lots of food. If you don't watch out, you will find the many menu options will have you thinking "food, food, food!" all the time! Would I take a cruise on this ship again? You betcha!